Dan Jay, Tufts University Faculty and Postdoctoral Officer joined us to teach us how to maximize the opportunity of attending scientific conferences! How do you work a meeting (pre-work)? Be strategic – who do you want to meet and why? 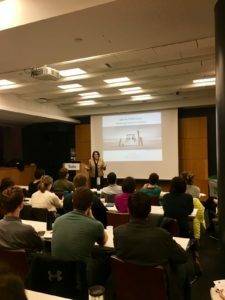 We were joined by Joanne Kamens, Executive Director of Addgene to learn more about management and leadership skills for scientists! PAC: Patiently listen. Ask at least one question. Confirm that you heard the message accurately. Do they hear both positive and negative feedback well? Focus on the results – what do you want to accomplish? Be detailed and let your team go.